"The main symbol that characterizes the Goraknathis are huge earrings worn in split ears. Gorakhathis are also called Kanphatas or Kanphata Yogis ('Kan' meaning ear and 'phat' meaning split), because at the initiation ceremony the ears are split to insert enormous earrings. The wearing of the earrings is of great importance. If one is broken, another must be substituted before the yogi can eat, engage in conversation, or carry out religious duties. Modern adherents claim this piercing in the central hollow of the ears is a technique by which the aquisition of magical powers is promoted." The piercing procedure is performed with "the double edge 'Bhairavi knife,' (Bhairavi is a manifestation of Shiva) ... Before the operation, the Nath Babas are called Aughars, meaning 'unfinished,' and many will never reach the second stage." 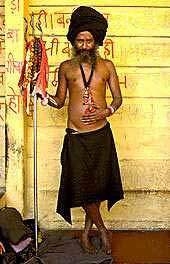 It is not known at what point in the development of this subgroup of Sadhus that they begun piercing their conchae, if they originated the practice, or if the practice existed in a previous sect. They have certainly been the only Hindu practitioners of this ritual for some time. An interesting point of trivia about the Nathas is that some Muslims joined the sects as well, and, because of this, the heads of some of the monastaries are known by the Muslim title pir ("holy father"). Because of the fighting that has gone on historically between Hindus and Muslims, this sect historically helped reduce some of the persecution. This page was last modified on 30 June 2006, at 04:19.